When you think of college basketball’s all-time coaching royalty, you don’t need to go very deep on the list to come across the name of John Thompson. When you think of college basketball’s current coaching royalty, you don’t need to go very deep on the list to come across the name of John Thompson III. They may be the greatest father-son coaching tandem in history. In 27 seasons, the father won 596 games and led Georgetown to 19 NCAA Tournament appearances, including three Final Fours and the 1984 National Championship. In 11 seasons, the son has won 249 games and led the Hoyas to the postseason every year, including eight NCAA Tournament berths and the 2007 Final Four. National Association of Basketball Coaches. But just because the son has followed the father’s career path does not mean the son has not stepped out from the shadow to make a name for himself. JTIII, as he is known, inherited a program that faltered a bit after his father left. In the six years from the time the father retired to the time the son was hired, Georgetown won just 58 percent of its games – not a bad winning percentage for most programs, but not acceptable to one which had won 71 percent of its games the preceding 27 seasons. 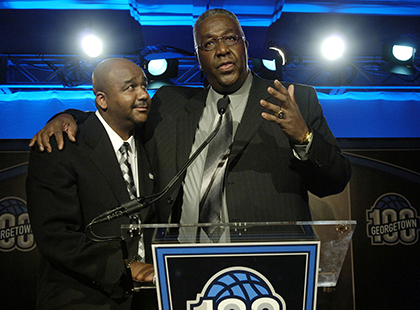 After the Hoyas went 13-15 in 2003-04, John Thompson III was hired from Princeton, where he played as an undergraduate for Hall of Fame coach Pete Carril and where went 68-42 in four seasons as head coach. Since then, he has brought the Hoyas back to national prominence and emerged from the shadow to become one of the best coaches in college basketball today.